Canadian interest rates are heading higher and probably faster than previously indicated. On October 24, the Bank of Canada(BoC) raised its overnight rate to 1.75% from 1.5% taking another step towards “neutral rates.” The BoC believes “neutral” for the overnight rate is 2.5% to 3.5%, which suggests there are still three to seven, quarter-point interest rate hikes in the pipeline. To many analysts and traders, dropping “gradual” suggests “rapid.” They bought Canadian dollars leading to a one and a third cent rise in the value of the Loonie to the US dollar for the day. The Bank of Canada doesn’t necessarily agree with that conclusion. Deputy Governor Carolyn Wilkins and Governor Poloz said they dropped the sentence to remove the “perception” in markets that the BoC was on a predetermined course for the path of rates. They pointed out that there were many factors which could trigger a quicker or slower pace to policy moves. Monetary Policy Report forecasts upgraded the inflation estimates for Q4 2018, 2019, and 2020. 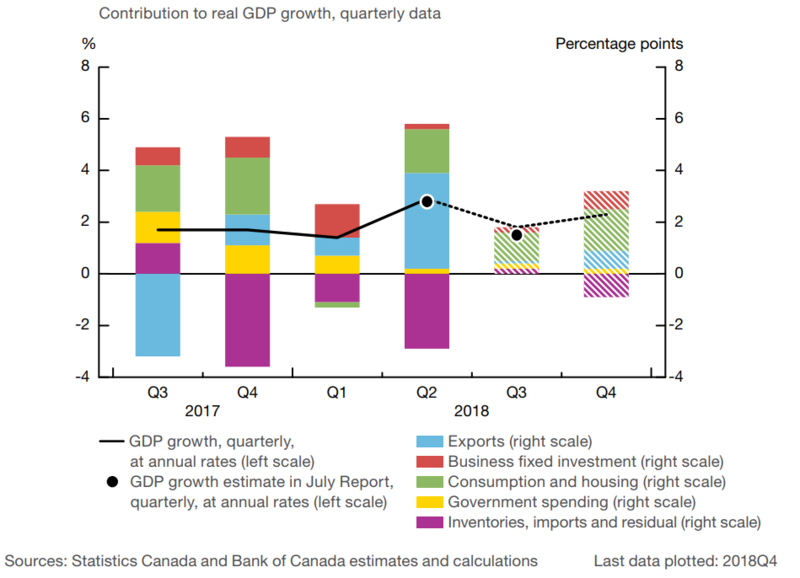 Q4 GDP forecasts were trimmed in 2018, hiked in 2019 and left unchanged for 2020. Those moves support the higher pace of rate increases view. The MPR also highlighted several risks to the inflation outlook. They included: an escalation of the United States and China trade conflict, a pronounced decline in house prices, positive confidence effects from the USMCA, stronger real GDP growth in the US and a sharp tightening of global financial conditions. Depending upon the event, any one of these concerns could lead to an interest rate hike, or cut. The BoC may downplay the significance of a change in wording in the policy statement, but anecdotal evidence suggests it shouldn’t be ignored. The Bank of Canada raised the overnight rate on January 17 and at that time, they said: “Governing Council will remain cautious.” They continued to remain “cautious” for the next two meetings and then on May 30, switched gears and wrote, “Governing Council will take a gradual approach to policy adjustments.” Gradual meant that forty-two days later the overnight rate rose to 1.5% from 1.25%. On October 24, the overnight rate increased again, and the reference to “gradual” landed in the shredder. It also put a December 6 hike on the table. “Will they or won’t they” is the 0.25% question. The MPR report makes a good case for higher rates. It said that economic growth is tacking close to potential and its composition is more balanced than last year. Inflation is expected to stay within the target range. It suggested that the completion of the US/Canada trade talks paves the way for increased investment and exports. Mr Poloz pointed out that even though the Bank believes the economy is operating at or near capacity, it is not really a measurable variable. He suggested capacity could be 1% higher or lower from where it is assumed to be. Arguably, if it is assumed to be higher, the odds of a December move increase substantially. Higher rates usually mean a stronger Canadian dollar but there are external forces at play, including contagion effects from the China/US trade conflict. China has reportedly eased restrictions for dealing with North Korea which may undermine the US/NK denuclearization effort. The US is taunting China by sailing Navy ships through the Strait of Taiwan which China may view as a “tacit “endorsement of Taiwan. The IMF downgraded their forecast for global economic growth to 3.7% from 3.9% and blamed the “recently announced trade tariffs for the move. Global equity markets are in distress. The Dow Jones Industrial Average (DJIA) has been in a free-fall throughout October and has lost close to 6% as of October 24, The S&P 500 and NASDAQ are even worse off, losing 6.8% and 8.75%, respectively. Traders are rattled by rising US interest rates, Emerging Market volatility and the impact of tariffs. Other concerns are geopolitical issues; from Brexit in the UK, Italy, and the European Union’s budget impasse, to Iran oil sanctions and Saudi Arabia’s murder of a journalist. The notion of a faster pace of rate hikes may underpin the Canadian dollar in the short term, but external forces may see the pace lose a step.